The Kansai International Airport (KIX) services the cities of Osaka, Kyoto, Nara, and Kobe. If you hold a Japan Rail Pass, travel from the airport can be a simple and exciting process, as the Japan Railway West’s Express Haruka train offers direct transportation from the Kansai International Airport to downtown Osaka and Kyoto. International travelers may find navigating the Japan Railway system to be intimidating, especially if trains are not used extensively in their country of origin. This trek, in particular, can be a bit confusing for first-time users of the Haruka service. This guide is designed to make it clear how to get to downtown Osaka and Kyoto for free on the Haruka Express. The Haruka is a limited express, airport rail link train service. The train offers rapid service between Maibara (in the Shiga prefecture) and the Kansai International Airport (KIX), reaching speeds of 130 km/h (80 mph). While the use of this train generally requires both a train fare ticket and a limited express ticket, Japan Rail Pass holders are admitted free of charge. Each train has six to nine cars, with at least one Green Car, or first class car. Two to three cars on each train are for non-reserved seating, and the remainder are for reserved seating. Each train contains restroom facilities, a vending machine, luggage racks, and is wheelchair accessible. Free Wi-Fi service is also provided. In the interest of passenger safety, smoking is prohibited on all Haruka Express train cars. To travel from the Kansai Airport to the city of Osaka, board the Limited Express Haruka at the Kansai Airport Station using your Japan Rail Pass. Take the Haruka to Shin-Osaka Station, a journey of about one hour. At Shin-Osaka, transfer to a local train to Osaka Station. The trip from Shin-Osaka to Osaka takes only three to four minutes. Alternatively, you can also want to get on the previous station, at Tennoji Station, which is slightly closer to the city center. Apart from the Haruka Express, you can also use a Kansai Airport Rapid Service train, or Kanku-kaisoku, to travel directly to Osaka Station, although this is a slightly slower route than the Haruka. The takes just over an hour and is also covered by the Japan Rail Pass. Buses and limousine services are also available from the airport to Osaka. Expect travel time using these methods to be about seventy minutes, with a fare of ¥1500. Note: if taking the Rapid Service train back to Kansai Airport, sit in one of the first four cars, as the remaining cars depart for Wakayama at Hineno Station. The Limited Express Haruka is the only direct train service from Kansai Airport to Kyoto station. The one-way trip takes around one hour and fifteen minutes and is free with the Japan Rail Pass. The itinerary is the same as going to Osaka, but getting off two stations later. From the Kyoto station, you may use other JR lines (such as the JR Nara line) bus or taxi services to travel anywhere in the city or nearby. The Haruka Express runs several times daily from the Kyoto Station to the Kansai Airport Station. The train also stops in Osaka at the Shin-Osaka Station and the Tennoji Station. For other destinations here is the full list of stations served by the JR Haruka Express trains. Note: The Osaka Station (downtown) is bypassed by the Haruka route, but can be accessed by transferring to a local train. Nara, Namba, Universal City, and other locations can also be accessed by transfers. The Haruka makes thirty return trips daily, from Maibara to the Kansai airport and back, for a total of sixty one-way trips. Each one-way trip between the Airport Station and Kyoto station takes around one hour and fifteen minutes. Trains depart every thirty minutes during the day and evening. From the Kansai airport, departures begin at 6:30 AM and continue until 10:16 PM. Trains run from 6:37 AM to 10:50 PM at Tennoji Station, from 6:17 AM to 9 PM at Shin-Osaka Station, and from 5:45 AM to 8:30 PM at Kyoto Station. Times may vary slightly on weekends and holidays. Once you pass through the ticket barrier at each station, you will see a timetable for the trains. Be sure to check the timetables for unexpected delays or boarding changes. Look for the name of the train line you are using and the direction (which stations are serviced) displayed at the top of the timetable. You can then find the train type – in this case “Ltd. Haruka”), the train number, departure time, destination, and platform number scrolling across the digital screen. The departures are numbered from one to sixty. Odd numbered trains (one, three, five, etc.) run south toward the airport, while even-numbered trains (two, four, six, etc.) run north, toward Osaka and Kyoto. I will be arriving to Kansai airport on 21 Apr (5 days trip) and plan to go around Kyoto, Osaka and Nara. Which JR pass that i need to buy? I will be based in Kyoto. Just want to ask for some advice.. I will leave Tokyo on 28th, so planning to travel maybe to Osaka or Kyoto for 4 nights. May i know what JR pass should i get and how to get to Kansai airport from Kyoto ? Hi Admin. Im Lina from Indonesia, my first go to japan on January 13th. My flight will be landed at 6 am in the morning and want go straight toTokyo. I can not change my flight and my friend already in Tokyo. Since you don’t have route directly from kanzai kix airport to Tokyo, which best way to go Tokyo? Need detail info from you, if i use Haruka to Kyoto, which station I must to stop and change to go to Tokyo? What time train from kanzai to kyoto? And frm Kyoto to Tokyo, what time the train will depart? Hi. My family and I will be using the JR 7 day pass. We will be travelling from Nara to Kansai airport. Correct me if I’m wrong, we need to board the Yamatoji Rapid Service and alight at Tennoji to board the Ltd Exp Haruka. Would also like to know whether we need to make a reservation earlier to board the Ltd Exp Haruka heading to Kansai Airport? Yes, that is the route covered by the JR Pass to get from Nara Station to KIX airport. Please check Hyperdia for the exact timetables. Reservation for the Haruka Express is not needed. However, you can do it online via this page: https://www.westjr.co.jp/global/en/ticket/pass/howto/. Hi, my husband and I will be arriving Kansai Airport on 13/11 and will travel to Koyasan and thereafter Kumano Kodo; and Wakayama before returning to Kansai Airport for flight home. Appreciate if you can please advise what type of pass I should get. Duration of my trip is 10 days. Thank you. You can either take the 7-day JR Pass or the 14-day JR Pass. Please keep in mind that for the 7-day JR Pass you would have to pay for one of the two Haruka Express tickets. Also, we recommend you check our guide about how to get to Koyasan as the journey is not fully covered by the pass. I have 3 questions, hope you can help me! 1. If I need to reserve a one way Haruka for March of 2019, when is the quickest I can begin to reserve? 2. Also there is no guarantee what time I will be able to get through immigration due to heavy congestion in immigration, what if I miss the time to get on the Haruka? 3. I’m a solo traveler with 1 large and 1 medium luggage, will there be space on the train to accompany me? Would a green seat give me more space? Also, regarding your luggage, there should be no problem either in the standard section. last train at 10.16pm is a joke, given kansai airport still have so many night flights touching down. your last train should expand to midnight at least for the tourist convenient. After 10:16 pm, you can still take the Kansai Airport Rapid Service to Osaka and Kyoto (usually until 11:32 pm). Please check the timetable at http://www.westjr.co.jp/global/en/timetable/. Hello, I am Red, I will be going to buy the 4 day JR west kansai area pass. If I activated it to use the Haruka express to kyoto station at maybe 6pm does it end on 6 pm of the fourth day . Or 6 pm – 12 am is counted as first day. I hope this question makes sense to you. Anyway, thank you. I am trying to decide whether to buy kansai one pass or kansai area pass. The Japan Rail Pass validity period is calculated in days, not in hours, so you should have no problem. Please check our FAQ about the JR Pass validity for further information. We will be arriving at Kansai airport on March 28th, 2019 and staying in Osaka for a day. We will be purchasing a 7 day japan rail pass , but intend to only activate it on the 31st( as we need to use it until the time we leave on the 7th from Osaka). My question, is whether we will still be able to use the Haruka express for FREE from the airport to downtown Osaka even though the pass will not start till the 31st. Hi Kirthana! The Haruka Express is free as long as you hold a valid, active Japan Rail Pass. If you haven’t activated it, you will need to pay for this trip separately. Hi. I visited Tokyo and Kyoto this past July using the JR pass. This November, I plan to visit Osaka (arriving by KIX,) Kobe, and continue by Shinkansen to Tokyo, departing by NRT for the end of my trip. Can I buy the same type JR Pass that I used for Tokyo for my November trip? Hi Steve! Yes, you can purchase the Japan Rail Pass again for your upcoming trip. There is no limit on the amount of trips you use this pass on. Happy travels! I will be traveling to Osaka and Kyoto from 11/25-30/18, will spend first three days in Kyoto and two days in Osaka. What is the best way to get train tickets for the entire trip? I am Lam and will be in Kyoto on January 2019 with my family (6 people). We’ll get a JR pass Kansai 3days. Our flight back is at 10:50 AM. We have to be at the airport round 8:00 AM. At what time do we have to take the JR Airport Express Haruka from Kyoto station to reach the airport in time? Hi Maui! To get the exact platform information please check Hyperdia, the number 1 Japanese online transportation planning tool that will help you greatly in organizing your trips in Japan. I am travelling to Osaka in August 2018 and my route and itinerary as below. 29 August arrive Kansai 9.35PM fand i want to go straight to Kyoto from Kansai Airport. What is the best mode of transport to go Kyoto from Kansai AirportT? I reckon to clear custom and baggage in 45min maximum. I need advise what type of Pass should i purchase for my trip below? Travel 2pax Adult. Appreciate if you can assist me on this. Thank you. I am Pauline and I will travel to Japan on December 2018. I will arrive Kansai airport at 21:05, and i going to Kyoto. Due to need to spend some time to go through immigration, collect baggage and change JR ticket, not sure whether can catch up Haruka train schedule 22:15. Is there any train schedule later than this time i can take? Hi Pauline! As specified in this article, Haruka Express’ departures begin at 6:30 AM and continue until 10:16 PM. Later than that it won’t be possible to catch that train. We recommend you to check with your hotel/rental apartment which would be the best way to reach them given this arrival time. Enjoy Japan! Hi, I am not intending to get a JR pass and would be traveling from Kansai Airport to Shin Osaka via Haruka Express. May I know how can I go about buying the tickets? Do I need to buy the tickets online or can I get them just before boarding the train? I am not sure if I will arrive in time to board the last train. 4. Take Shinkansen one-way from Kyoto to Tokyo. Depart from HND. What would be the most economical ticket option or combination for this trip? Thanks! Hi Marta! As detailed in this article you are commenting, the Haruka Express could be the best way of directly reaching Kyoto from KIX. I am Kim and I will travel to Japan on December 2018. I would like to go to Shin Osaka Station from Kansai International Airport. I found there have two different costs of JR Haruka Express. From KIX to Shin Osaka station, one cost 3300 yen (one-way) and another one is 1300 yen. May I know what is the different between this two types? Please assist. If I purchase the ICOCA + HARUKA package round trip to osaka, do I need to pay extra for the HARUKA express train, or is the package includes the fee, also can I use HARUKA express to get off at Tennoji station and make my way to Namba station with the same ticket, or is there a charge for the second leg. Last, is the return part of the ticket back to the airport a open ticket. Thank you for your article regarding the JR Pass. However, I am not sure if it’s worthwhile to get one. Would appreciate if you could kindly recommend what kind of pass should we buy. I am thinking of the 2-day passes while in Kyoto and Osaka. I am just confused and not sure of the train tickets for Kansai-Kyoto, Kyoto-Kanazawa, Kanazawa-Osaka, Osaka-Nara and Osaka-Kansai. All of them total 31,600-34,600 yen, which is more expensive than the nation wide pass (29,110 yen). Please also note you will be able to use this pass too in some local lines in Tokyo, in Kyoto and in Osaka and hence the savings would be greater. After arriving Kansai Airport at 9.35pm on Apr 20, what is the fastest way to arrive Kyoto station by train? Thanks and awaits your feedback soon. Hi Jacq! The Haruka Express departs every thirty minutes during the day and evening. From the Kansai airport, departures begin at 6:30 AM and continue until 10:16 PM, and take you straight to Kyoto Station. And the best – this trip is included in your Japan Rail Pass! I flew into Kansai airport on March 28th at about 8:30 pm and it took over an hour to get through the very long immigration line (there were two earlier flights with foreign tourists ahead of our flight waiting in line already). After getting our luggage which took another 30 minutes, we were finally able to go to where the Kansai Airport Limousine bus stops were at about 10:30 pm. We also had five pieces of large luggage and even if we had been early enough to catch the Haruka Express (10:16 pm last train),which we weren’t, it wasn’t guaranteed that I could get all of our luggage into the racks. It would have depended on how much other tourists were going to the Kyoto Station with their luggage since there is only a limited amount of luggage space for each car. The Kansai Airport Limousine buses all have a lot of luggage space and they have no problem with that issue. The only thing is the ride to the Kyoto Station bus stop area will take almost 2 hours vs. 1 hour and fifteen minutes by Haruka Express train. The bus ride is kind of tedious with a lot of slowing down for the toll booths then speeding back up and the curves in the road. I will take a motion sickness tablet before I do the bus ride again. I bought some for the ride back to Kansai airport from Kyoto and I felt better. hi, I have a JR Kansai Hiroshima Area Pass. I need to arrive at Kansai International Airport around 7 am on 22 April 2018 (Sunday) for my flight home. 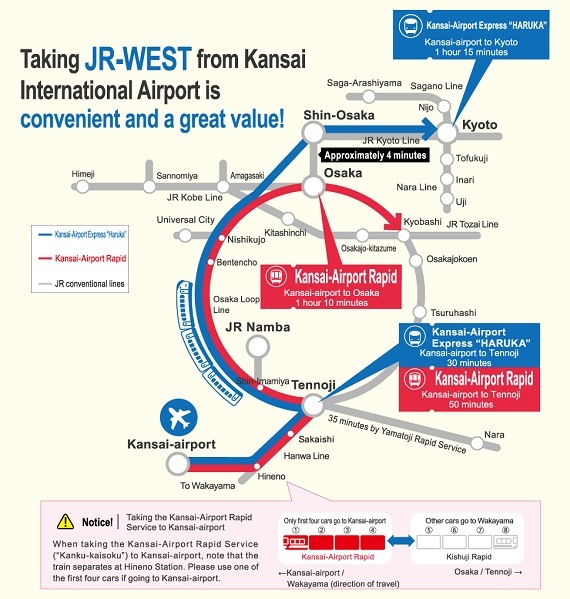 Your article mentioned that JR pass cannot be use for Kansai-Airport Rapid Service. That means I must take the Osaka Loop Line from Osaka Station to Tennoji Station and then change to Ltd. Express Haruka at Tennoji Station to Kansai International Airport. 1) Can I use JR Kansai Hiroshima Area Pass for Osaka Loop Line? 2) Is Tennoji Station for Ltd. Express Haruka and Osaka Loop Line in the same building? Can I transfer directly from the Osaka Loop Line platform to the Haruka platform. Hi Audrey! Japan Rail Pass can be used to travel in the Kansai Airport Rapid Service, however it takes longer since it has more stops. This train can be taken directly in Osaka Station. 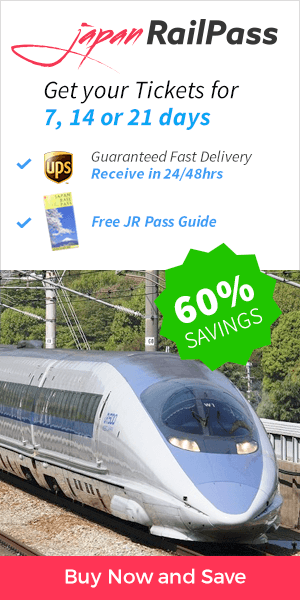 I was wondering if I need a JR pass from the airport (kix) to Kyoto and from Kyoto to Osaka and Osaka to the airport (kix)? Or is it cheaper to get individual tickets since I’m not going anywhere else? We (3 adults) will be travelling on 13April 2018 by the first train at 0545h LTD EXP HARUKA 1 from Kyoto station to Kansai Airport. We will be taking a taxi to Kyoto station. We would appreciate you could tell us clearly where shall the taxi drop us to walk to track #30 to board the said train. For such concrete information we recommend you to check Hyperdia, which offers detailed timetables, platform information, trip duration and exact distance. It will help you greatly in organizing your trips in Japan! Travellers are allowed luggage on board for no additional cost. However, there is a limitation of two pieces of luggage, both of which should have a maximum weight of 60kg and a total of 250 cm in height, length and width. There is a delivery service option. To get from Kansai Airport to downtown Osaka just take the Haruka Express (included in your Japan Rail Pass) as detailed in this article. Regarding how to get to your accomodation, please check this directly with them – they will be able to provide better advice. I am traveling to Japan landing at KIX airport at around 6 pm. Do you know how long this express train will take to reach Kyoto? As specified in this article you are commenting, the one-way trip from Kansai Airport to Kyoto takes around one hour and fifteen minutes and is free with the Japan Rail Pass. I will be travelling to Japan in end of April. Can you guide me on the transportation? What type of transportation can I take to reach the destination? – Once you land at Kansai Airport, you can take the Haruka Express straight to Kyoto as described in this article. – Once in Kyoto, local JR lines include the Sagano Line and the Nara Line. – From Kyoto you will be able to easily reach Kanazawa in the Limited Express Thunderbird train. This very same train will take you to Shin-Osaka Station later. I have an upcoming trip in May 2018 with 2 adults and 1 infant (1 yr old) and 1 toddler ( 3yrs old). I will be arriving to Kansai from another country. 2. Then from Kyoto take bullet train 1 way to Tokyo..
3. Then from Tokyo Air port to home — I’m not coming back to Kansai airport. ** ICOCA works in Kyoto subways/ train/buses right? 3. Does ICOCA work in Tokyo train /Subways/ buses? The Icoca Card is offered by JR West and services JR trains in the regions of Hiroshima, Kyoto, Osaka, and Okayama. It does not work in Tokyo. My flight to KIX is schedule to arrive at 3:25pm. I plan to get a 14days JR pass. My route this Nov 2018 will cover KIX-Tokyo-Kyoto-Osaka-KIX. I plan to take the Hikari bullet train to Tokyo from KIX upon arrival. 1) Where should I board the Hikari bullet train from KIX to Tokyo? 2) Do you think there’s sufficient time for me to catch the last bullet train upon custom clearance and exchange of JR pass? Or should I travel the next day instead? 3) What is the best way to travel from Tokyo to Kyoto? 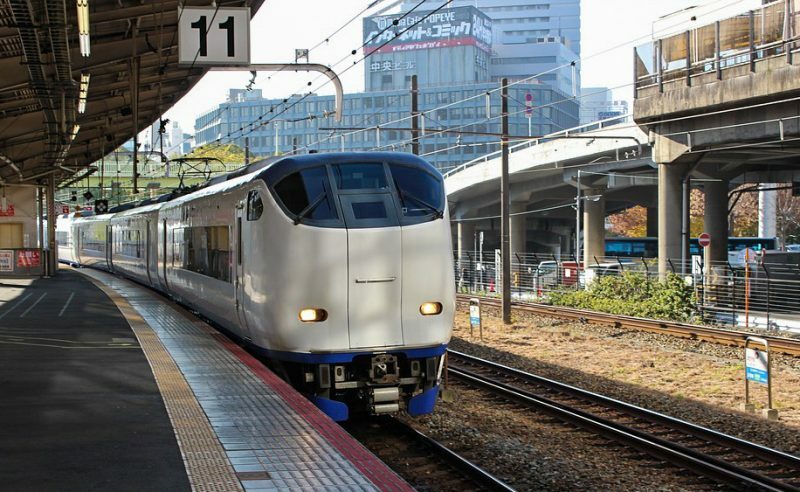 There is no direct connection from KIX to Tokyo and thus you should take the Haruka Express as specified in this article to either Kyoto or Osaka. Tokyo, Kyoto, and Osaka are connected with by the Tokaido Shinkansen line so it will be easy to reach Tokyo from any of these 2 cities. This is the easiest way to travel between Tokyo and Kyoto included in your Japan Rail Pass. As stated in this article, Haruka Express departures from KIX begin at 6:30 AM and continue until 10:16 PM. You should have enough time to catch the train. I plan to take JR 7 days pass. My flight will reach Kansai Airport on 7th April 2018 at 9.35pm. The last Haruka train depart from Airport will be 10.16pm, I afraid I won’t be able to catch the last train as may need time to exchange JR pass after custom clearance. Is there any better choice if I miss the last Haruka train 10.16pm? I have to go Kyoto or Shin-Osaka. Thanks! There is an alternative to the Haruka Express: the JR Kansai Airport Line, which is a short rail line that connects Kansai International Airport with the rest of the JR West railway network in Osaka. However you will have to make sure the hours work for you by checking timetables at Hyperdia, the number 1 Japanese online transportation planning tool. Can I buy ICOCA & Haruka one-way ticket from Kyoto to KIX any JR station at Osaka? Upon your arrival in Japan, you can purchase any IC Card (such as ICOCA) from a ticket counter or an automated kiosk at any major train station. Please make sure to check this with the company you purchase the Icoca + Haruka package, they will be able to better assist you. Please note the Icoca Card is offered by JR West and services JR trains in the regions of Hiroshima, Kyoto, Osaka, and Okayama. I will most likely be in Japan in July 2018. We will fly into Tokyo on Wed, July 4th then depart for Kyoto on July 9th. We would head to Osaka on Fri, July 13th. We think we will leave Osaka for Hong Kong on July 15th or 16th. With this said, would the 7 day JR Pass be sufficient? I read that I can ride the Narita Express and Haruku Express with a JR Pass. Would these rides be counted as part of my days in using a JR Pass? I’m sorry if it’s a silly question. Yes – the rides you make on the Narita Express and the Haruka Express have to be included in the validity period of your Japan Rail Pass, otherwise you will have to pay for them separately. The Japan Rail Pass validity period is calculated in days, not in hours. Therefore, if you have purchased a 7-day pass and your activation date (when you first use the pass) is the 9th of July, the exact expiration time will be midnight on July 15. A) Can I use this pass to travel on the limited haruka express train kansai airport to tennoji? B) What trains can I take to go to Shirakawa using this pass? C) Can you please also provide the directions to Nara? D) Please also advise the directions to Kyoto. I need to go from Kansai Airport to Bentencho. can I use route below. We are traveling to from Kansai Airport to Kyoto downtown on 17th Nov and returning from Kyoto to Kansai Airport on 21st Nov. Are there single tickets between the two places or do we have to buy a JR Pass for 5 days? Yes – it is possible to purchase single tickets to access the Haruka Express. However while the use of this train generally requires both a train fare ticket and a limited express ticket, Japan Rail Pass holders are admitted free of charge. Hi I will arrive in KIX morning 9am and will be taking Haruka to Kyoto directly. Are there any nearby bento shops/7-11 we can get our breakfast at KIX before boarding Haruka, also is food consumption allowed on the train? thanks. We recommend you to check the official Kansai Airport’s website to see all the available shops and restaurants should you want to purchase food in advance. However please note that most trains in Japan feature an on board food service. And of course – it is permitted to eat on trains! It is a great experience to have your lunch in train’s calm enjoying the amazing views. Hi. I just want to make a one way trip from kyoto station to kansai airport. It says that I should take Haruka express but when I try to book online, the options only ask me to collect from kansai airport. Am I just supposed to purchase at kyoto station ? The Limited Express Haruka operated by JR West is the only rail service between Kyoto Station and Kansai International Airport. It covers the distance in about 75 minutes stopping at Osaka City’s Shin-Osaka Station and Tennoji Station on the way. This train is covered by the Japan Rail Pass. If you do not have a Japan Rail Pass you might consider getting the ICOCA card. The normal fare for the journey between Kyoto Station and Kansai Airport Station is 2850 yen. The Limited Express Haruka runs about 30 round trips between Kyoto Station and Kansai Airport Station every day, so you can purchase it at Kyoto station, since the trains are scheduled to match the demand. I plan to take Haruka express from Kansai airport to Hikone, shiga upon arrival the first day. how much is Haruka 50 Limited express Maibara? If I don’t have Japan Rail Pass, where can I buy this ticket? If you don’t travel with a Japan Rail Pass you will have to purchase the ticket in the Ticket Office at the airport. I will travel to Japan in this coming October. My route will be KIX-KYOTO-OSAKA-KIX. What is the best way to reach directly to Kyoto? Is it by HARUKA express? And what would be the timetable for Haruka express? 2. What is the best option from KYOTO to Osaka? 3. Where is the Icoca Haruka ticket counter at KIX airport? Is it at 2F? The easiest way to reach Kyoto directly from Kansai Airport is through the Haruka Express, fully included in your Japan Rail Pass. Trains depart every thirty minutes during the day and evening. From the Kansai airport, departures begin at 6:30 AM and continue until 10:16 PM. Trains run from 6:37 AM to 10:50 PM at Tennoji Station, from 6:17 AM to 9 PM at Shin-Osaka Station, and from 5:45 AM to 8:30 PM at Kyoto Station. Times may vary slightly on weekends and holidays. Once you pass through the ticket barrier at each station, you will see a timetable for the trains. The best option to reach Osaka from Kyoto is taking the Hikari train on the Tokaido Shinkansen line. You will get between Kyoto Station and Shin-Osaka Station in less than 30 minutes. This trip is also fully included in your Japan Rail Pass. KIX- Kyoto-Kanazawa-Shirakawago-Takayama-osaka within 7 days. Should I get the JR pass or the Takayama-Hokuriku Area Pass. The Japan Rail Pass will cover trips nation-wide while regional passes only cover trips within a certain region. We recommend you to draw your itinerary to assess which pass would be more convenient for it. hi!, I will be travelling in Japan on October, I will arrive in Osaka, and travel to kyoto my question is at what time is the last train from osaka airport to kyoto? and also can I travel with my JR Pass to Nara and tokyo? For the exact operation hours of trains please check Hyperdia – the number 1 Japanese online transportation planning tool. It offers detailed timetables, platform information, trip duration and exact distance, which will help you greatly in organizing your trips in Japan. Regarding your question, yes – you can travel to Nara and to Tokyo at no additional cost if you hold a Japan Rail Pass. To get to Nara from Osaka just take the Yamatoji Rapid Train from Osaka Station to JR Nara Station. To travel from Osaka to Tokyo, you will need to take either the Hikari bullet train or Kodama from Tokyo or Shinagawa stations that will get you to central Tokyo. Both run on the Tokaido Shinkansen line, connecting the two cities. We are taking the Haruka to the airport hotel to check in and back to town for more shopping. Is there a limit on how many trips we can take the Haruka on the same day using JR pass? No, there is not a limit on the amount of times you can take the Haruka Express using your Japan Rail Pass. You can make unlimited rides in any of the included transportation while the pass is still valid. i will be traveling to Kansai-Osaka-Kyoto-Kansai by last week of september. what is the best and economical way to do this? The most economical way of travelling will depend on your scheduled trip: generally, the more you travel, the more economical gets the Japan Rail Pass. Please note transportation in Japan is not cheap and savings can be big. To assess which is the best option we recommend you to draw all trips you want to make and compare its individual prices (you can check Hyperdia) to the cost of the Japan Rail Pass. 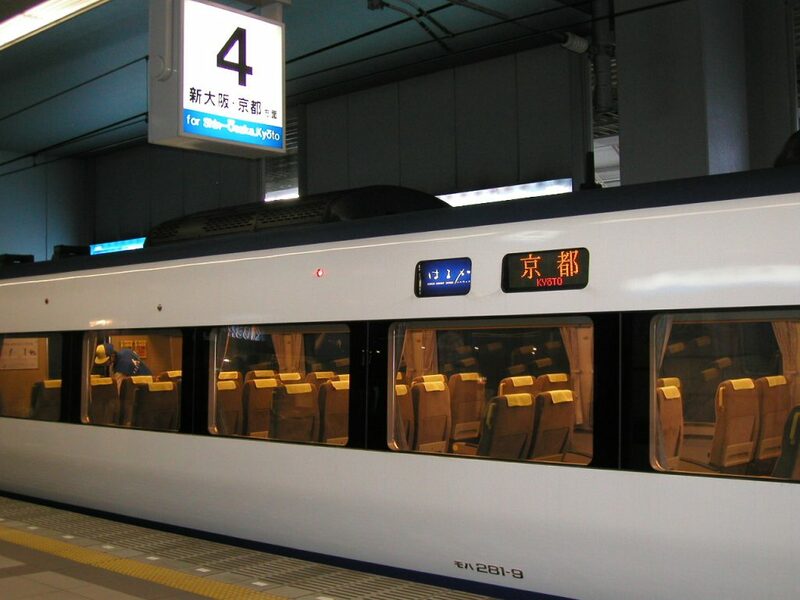 – To travel from the Kansai Airport to the city of Osaka, board the Limited Express Haruka at the Kansai Airport Station using your Japan Rail Pass. Take the Haruka to Shin-Osaka Station, a journey of about one hour. – To travel between Kyoto and Osaka take the Hikari train on the Tokaido Shinkansen line. You will get between Kyoto Station and Shin-Osaka Station in less than 30 minutes. Is there a limit to how many times we can use the jr pass for haruka train? There is not – while the Japan Rail Pass is still valid you can travel unlimitedly in all of the included transportation. Hi, I’m taking 3 days JR west pass. Can I use this pass to go from Osaka to Kansai Airport using Haruka Express? The Kansai Area Pass seems to include Haruka Express. However, for accurate information, please check with JR West website at http://www.westjr.co.jp/global/en/ticket/pass/. I bought the Takayama Hokuriku Tourist Pass( 5 days) for my trip in coming November. 1. Can I use it to travel by Limited Exp. Thunderbird from Shin Osaka Station to Kyoto? 2. Does this pass cover any local transport in Kyoto? 3. Can I use the Haruka from Kyoto back to Tennoji station. 4. Does this pass cover any local transport in Osaka? 5. Does this pass cover local transport in Kanazawa? 6. How to book seats to Shirakawa-go? Unfortunately we don’t have much information on the Takayama Hokuriku Tourist Pass. Basically it grants unlimited rides on JR conventional lines running between Nagoya, Gero, Takayama － Toyama, and linking Kansai-airport, Osaka City area, Kyoto, Kaga-Onsen － Kanazawa, and “Hokuriku Shinkansen” running between Kanazawa and Toyama. Please make sure to visit Tourist Pass official website for all the information of this pass. Hi, I plan to go Shirakawa from Kansai airport, may I know is the Kansai Hokuriku area pass suitable for my plan? Thanks! There are no train services to Shirakawa-go, but the Nohi Bus is available from Takayama. The trip lasts approximately one hour. Individual tickets can be directly during your stay in Takayama. How do I reserve seats on Haruka train from KIX to Kyoto station, will I have to pay extra ? Can I reserve a one way pass online ? JR Pass holders can book a seat on all Japan Rail trains such as Haruka Express free of charge. All seat reservations should be done before boarding the train. To reserve your seat, please go to any Ticket Office (Midori-no-madoguchi). I will arrive KIX on Nov 19 (SUN) 21:40. I think that I will wait my bag and pass custom on 22:10. But last train is 22:18. Can I buy ticket at JR counter at that time? If not, I need to go on next day 6:35. Can I buy ticket at JR counter in the morning? The Japan Rail Pass be will sold at a higher price and on a trial basis in Japan from March 8, 2017 through March 31, 2018 at major stations and airports among which you have KIX. The ticket office in Kansai Airport is opened from 5:30 to 23:00. I intend to take the Haruka Express from Kansai to Kyoto. Can I use the JR Pass for Green Car reserved seating? If you are travelling with a Green Pass you will be entitled to book green seats at no additional cost. However if you are traveling with a Standard Pass you will need to pay an additional fee to travel in the green seats area. Hi I will be travelling to Osaka next week. I just have a few questions regarding the use of the Haruka express to Shin-Osaka. It says that it “requires both a train fare ticket and a limited express ticket”. If so, where can I buy these tickets and how much would it cost? Is there an online schedule for the Haruka express? Those mentioned tickets are only needed if you don’t travel with a Japan Rail Pass. Japan Rail Pass holders are admitted in Haruka Express free of charge. 1. Is the pass valid on Haruka Experss, if so, do we need to reserve the seat before boarding? 2. Can I travel on this Haruka Express from Tennoji to Kyoto back and forth during the stay? The Kansai Area Pass is valid on non-reserved seats on the Haruka Express. However if decided to purchase the Japan Rail Pass you would be able to travel also on the reserved seats. I will visit Osaka and Kyoto on May 2017, how to choose a pass for Osaka to USJ, Tokyo – Mt Fuji and two days in Osaka using the pass? The Japan Rail Pass will fully cover the trips you want to make: it will allow you to travel between Tokyo, Osaka and Kyoto by taking the Shinkansen Hikari. The pass also gives you access to Osaka city Loop line. The station for USJ (Universal Studios Japan) is ‘Universal City’ and is fully serviced by JR, you can find all access details in their official website. You will also be able to reach Mount Fuji at no additional cost. How do I find any information on traveling from Narita International Airport to Kyoto’s hotels or Kyoto’s area? You can find all the information you need regarding transportation in Japan at our Hyperdia page. Also, here is an article on how to get from Narita Airport to Tokyo. Once in Tokyo, use the Hyperdia page to learn what is the best way for you to get to the city of Kyoto.